What is a grandfather clock? A grandfather clock is a floor clock that is operated by the movement of a swinging pendulum and suspended weights enclosed in a cabinet at least six feet tall. How do grandfather clocks work? The pendulum swings back and forth by the force of gravity allowing the weights to drop at given paces. The functions of the clock are then driven by the movement of the weights. The weights are either suspended by chains or cables and need to be adjusted periodically to keep proper time. Grandfather clocks are very accurate and can keep time to within one minute per month. Are grandfather clocks hard to set up? Actually they are much easier to set up than you might think. This is because you are doing just that, setting it up and not building it. All that is required is a little time and some basic tools. How do you wind them? Pulling on the chain or using the winding crank lifts the weights up. This should be done once a week. Can grandfather clocks be turned off at anytime? Yes, most grandfather clocks have a night shut-off lever which allows you to disable the sounds and movements at anytime, while still keeping the correct time. What is the difference between cable-driven and chain driven? 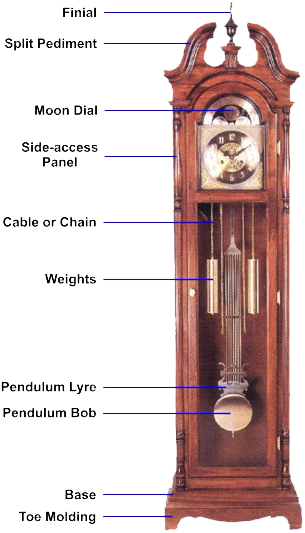 The cable-driven grandfather clock is wound by inserting a key or crank to set the weights, whereas the chain-driven grandfather clock is wound by pulling the chains until the weights are in the correct position. A disc-shaped body (bob) suspended by cables from a fixed support that swings freely back and forth under the influence of gravity, which operates the clock and assures accurate time. The crown is generally referred to as being he top portion of the grandfather clock. The most common crown styles are the split pediment and the bonnet, which has a full arched facade. Other common styles are arched, flat top and federal crowns. Where do the different chimes come from? Winchester Chimes - The melody of the chimes in the Cathedral in Hampshire, England. St. Michaels Chimes - The melody of the chimes in St. Michael's Church in Galveston, South Carolina. Westminster Chimes - The melody of the chimes in the Clock Tower at the House of Parliament in London. Whittington Chimes - The melody of the chimes of St. Mary Le Bow Church in London. What is a moon dial? A dial usually found at the top of the clock face which tracks the moon's phases through the 29-1/2 days of the lunar month. As the rotating moon dial passes behind the Eastern and Western Hemispheres, the phases of the moon are represented as they appear at each stage of the cycle: new moon, waning crescent, half moon etc. What do the weights do? The weights provide the motive force which drives the clock mechanism in grandfather clocks, including making the clock strike, keeping the time, and playing chimes. Weights slowly fall over the course of a week and so must be raised every seven days, or the clock will stop running. They are usually constructed of a weighted insert with a brass shell. How do you raise weights? Cable driven weights are raised by using a crank, and chain driven weights are raised by pulling on the loose end of the chain. What polish or oil should be used to maintain the case of wooden clocks? 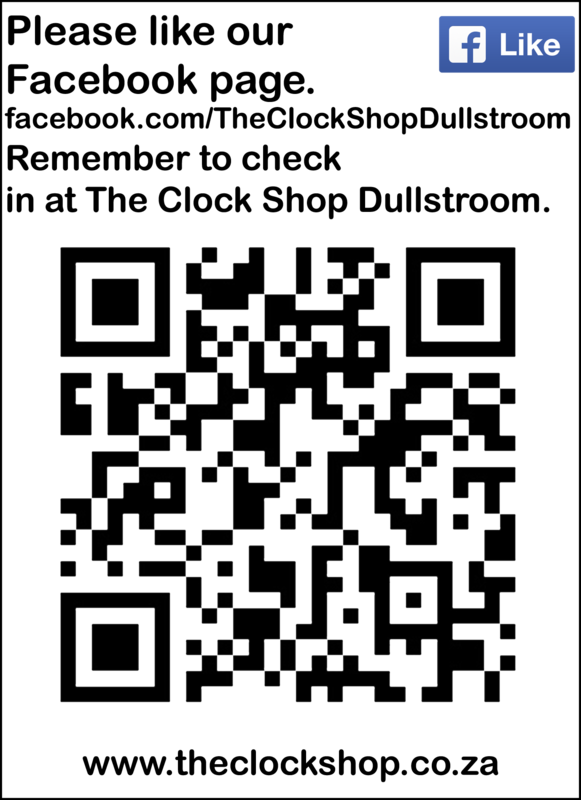 Do not use any polish or oil. The case should simply be wiped with a soft dry cloth . If the timepieces are made from Chinese wood, how will they be affected by our South African climate and will they eventually crack? All lumber is kiln dried before processing and should not be affected by average weather conditions. How long will the mechanics of grandfather clocks last? Generally speaking, the mechanical movements should last at least 50 years.